The Board owns, operates and maintains electric transmission and distribution facilities within and adjacent to the city limits of Sylacauga in Talladega County, Alabama. 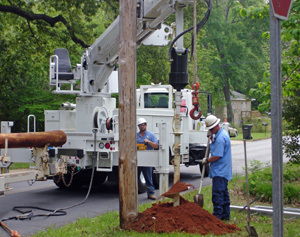 The Board is providing service to 6,360 electric customers in a service area of approximately 16 square miles. Communities served outside Sylacauga include Mignon, Walco and Oldfield. The Board currently employs 10 personnel in the Electric Department. The Board purchases the majority of its power from the Alabama Municipal Electric Authority (AMEA). AMEA is a public corporation of the State of Alabama and was incorporated on August 17, 1981. AMEA is comprised of eleven members, consisting of municipalities and utility boards located in the State of Alabama, each of which owns and operates an electric distribution system. The Board has been able to reduce its cost of purchased power by more than ten (10) percent as a result of purchasing power from AMEA and looks forward to continued savings in the future years. Approximately seventy-five (75) percent of the Board's power requirements are furnished by AMEA and the Southeastern Power Administration (SEPA) furnishes the remaining twenty-five (25) percent. SEPA is a power marketing agency under the Department of Energy established to market hydroelectric power from Federal flood control projects, giving preference in the sale of such power to public bodies and rural electric cooperatives. Based on recent residential rate comparisons, the Board's electric rates are 8% below those charged by the neighboring investor owned utility and 14% below the rates of the nearest rural electric cooperative. The Board was one of the first electric utilities in Alabama to install a computer controlled load management system to control peak demand. This system has been very successful in reducing the cost of purchased power and the Board continues to expand the scope of its load management activities. The Board is currently upgrading its Supervisory Control and Data Acquisition ("SCADA") system which allows the Board to monitor power usage and curtail load during high system usage. This is done utilizing our load management system soon to be tied to our SCADA system and will save our customers money by averting the purchase of extremely costly energy. The SCADA system also allows for fast determination of abnormal system conditions (i.e. outages, sags, swells), allowing quick remediation. The Board has recently completed a 4 KV to 12 KV voltage conversion. Originally the downtown area was served by two 4 KV substations. The conversion allowed the Board to standardize on 12 KV equipment and gave the Board greater flexibility with more interties. Also the conversion is saving the Board approximately $90,000 per year in reduced electric losses. An additional benefit to this conversion is increased system reliability as a result of having all of our substations operating at the same voltage.